SADJE, Hadje Cresencio. THE TRAGEDY OF ROHINGYA PEOPLE, THEIR TRAGEDIES OR OURS? A FILIPINO’S REFLECTION ON THE ROLE OF ASEAN COMMUNITY. JATI - JOURNAL OF SOUTHEAST ASIAN STUDIES, [S.l. ], v. 22, n. 1, p. 48-57, dec. 2017. ISSN 2600-8653. 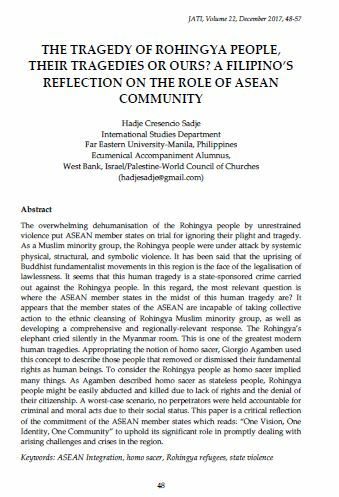 Available at: <https://jati.um.edu.my/article/view/10245>. Date accessed: 21 apr. 2019. doi: https://doi.org/10.22452/jati.vol22no1.4.